Комплект за зацепване на разпределителните валове при автомобили със 2 разпределителни вала. Ford, Honda, Land Rover, Rover, VW, Renault, Citroen, Peugeot, Fiat and Vauxhall/Opel. 19PC PETROL ENGINE TWIN TIMING CAM LOCKING SETTING & FLYWHEEL HOLDING TOOL KIT,ZR-36TT19 -ZIMBER TOOLS. Description: This kit consists of adequate tools to lock the camshafts on twin cam (multi-valve) engines in order to stop them rotating out of timed position when the timing belt is replaced and removed. 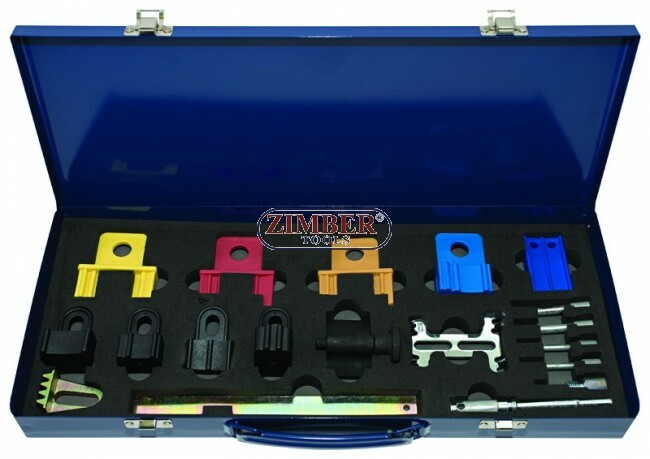 It also provides different camshaft locking pins that can cover specific crankshaft and flywheel locking applications. The service will be easier and reduce the risk of incorrect valve timing from taking place. Kit also supplied with two popular flywheel holding tools. They are ideal and essential for removing the crankshaft pulley when replacing the timing belt. Ford, Honda, Land Rover, VW, Renault, Citroen, Peugeot, Fiat and Vauxhall/Opel.